From Wikipedia, the free encyclopedia[hide]This article has multiple issues. Please help improve it or discuss these issues on the talk page. Expectancy theory proposes that an individual will decide to behave or act in a certain way because they are motivated to select a specific behavior over other behaviors due to what they expect the result of that selected behavior will be. In essence, the motivation of the behavior selection is determined by the desirability of the outcome. However, at the core of the theory is the cognitive process of how an individual processes the different motivational elements. This is done before making the ultimate choice. The outcome is not the sole determining factor in making the decision of how to behave. Expectancy theory is about the mental processes regarding choice, or choosing. It explains the processes that an individual undergoes to make choices. In the study oforganizational behavior, expectancy theory is a motivation theory first proposed by Victor Vroom of the Yale School of Management. Victor H. Vroom (1964) defines motivation as a process governing choices among alternative forms of voluntary activities, a process controlled by the individual. The individual makes choices based on estimates of how well the expected results of a given behavior are going to match up with or eventually lead to the desired results. Motivation is a product of the individual’s expectancy that a certain effort will lead to the intended performance, the instrumentality of this performance to achieving a certain result, and the desirability of this result for the individual, known as valence. In 1964, Vroom developed the Expectancy theory through his study of the motivations behind decision making. His theory is relevant to the study of management. Currently, Vroom is a John G. Searle Professor of Organization and Management at the Yale University School of Management. The Expectancy Theory of Motivation explains the behavioral process of why individuals choose one behavioral option over another. It also explains how they make decisions to achieve the end they value. Vroom introduces three variables within the expectancy theory which are valence (V), expectancy (E) and instrumentality (I). The three elements are important behind choosing one element over another because they are clearly defined: effort-performance expectancy (E>P expectancy), performance-outcome expectancy (P>O expectancy). Expectancy is the belief that one's effort (E) will result in attainment of desired performance (P) goals. Usually based on an individual's past experience, self-confidence (self efficacy), and the perceived difficulty of the performance standard or goal. Factors associated with the individual's Expectancy perception are self efficacy, goal difficulty, and control. Self efficacy is the person’s belief about their ability to successfully perform a particular behavior. Goal difficulty happens when goals are set too high or performance expectations that are made too difficult are most likely to lead to low expectancy perceptions. Control is one's perceived control over performance. In order for expectancy to be high, individuals must believe that they have some degree of control over the expected outcome. Instrumentality is the belief that a person will receive a reward if the performance expectation is met. This reward may come in the form of a pay increase, promotion, recognition or sense of accomplishment. Instrumentality is low when the reward is the same for all performances given. Factors associated with the individual's instrumentality for outcomes are trust, control and policies. If individuals trust their superiors, they are more likely to believe their leaders promises. When there is a lack of trust in leadership, people often attempt to control the reward system. When individuals believe they have some kind of control over how, when, and why rewards are distributed, Instrumentality tends to increase. Formalized written policies impact the individuals' instrumentality perceptions. Instrumentality is increased when formalized policies associate rewards to performance. Valence: the value the individual places on the rewards based on their needs, goals, values and Sources of Motivation. Factors associated with the individual's valence for outcomes are values, needs, goals, preferences and Sources of Motivation Strength of an individual’s preference for a particular outcome. In order for the valence to be positive, the person must prefer attaining the outcome to not attaining it. When deciding among behavioral options, individuals select the option with the greatest amount of motivational force (MF). Expectancy and instrumentality are attitudes (cognitions) that represent an individual's perception of the likelihood that effort will lead to performance that will lead to the desired outcomes. These perceptions represent the individual’s subjective reality, and may or may not bear close resemblance to actual probabilities. These perceptions are tempered by the individual's experiences (learning theory), observations of others (social learning theory), and self-perceptions. Valence is rooted in an individual’s value system. One example of how this theory can be applied is related to evaluating an employee’s job performance. One’s performance is a function of the multiplicative relationship between one’s motivation and ability [P=f (M*A)]  Motivation can be expressed as [M=f (V*E)], or as a function of valence times expectancy. In layman’s terms, this is how much someone is invested in something along with how probable or achievable the individual believes the goal is. Victor Vroom’s expectancy theory is one such management theory focused on motivation. According to Holdford and Lovelace-Elmore (2001, p. 8), Vroom asserts, “intensity of work effort depends on the perception that an individual’s effort will result in a desired outcome”. Vroom suggests that “for a person to be motivated, effort, performance and motivation must be linked” (Droar, 2006, p. 2). Three factors direct the intensity of effort put forth by an individual, according to Vroom; expectancy, instrumentality, and preferences (Holdford and Lovelace-Elmore, 2001). In order to enhance the performance-outcome tie, managers should use systems that tie rewards very closely to performance. Managers also need to ensure that the rewards provided are deserved and wanted by the recipients. In order to improve the effort-performance tie, managers should engage in training to improve their capabilities and improve their belief that added effort will in fact lead to better performance. - Emphasizes self-interest in the alignment of rewards with employee's wants. Expectancy Theory, though well known in work motivation literature, is not as familiar to scholars or practitioners outside that field. Lori Baker-Eveleth and Robert Stone, University of Idaho, conducted an empirical study on 154 faculty members’ behavioral intentions/responses to use of new software. The antecedents with previous computer experience ease of the system, and administrator support for they are linked to behavioral intentions to use the software through self-efficacy and outcome expectancy. Self-efficacy and outcome expectancy impacts a person’s effect and behavior separately. Self-efficacy is the belief a person has that they possess the skills and abilities to successfully accomplish something. Outcome expectancy is the belief a person has when they accomplish the task, a desired outcome is attained. Self-efficacy has a direct impact on outcome expectancy and has a larger effect than outcome expectancy. Employees will accept technology if they believe the technology is a benefit to them. If an employee is mandated to use the technology, the employees will use it but may feel it is not useful. On the other hand, when an employee is not mandated, the employee may be influenced by other factors that it should be used. The self-efficacy theory can be applied to predicting and perceiving an employee’s belief for computer use (Bandura, 1986; Bates & Khasawneh, 2007). This theory associates an individual’s cognitive state affective behavioral outcomes (Staples, Hulland, & Higgins, 1998). Motivation, performance, and feelings of failure are examples of self-efficacy theory expectations. The following constructs of the self-efficacy theory that impact attitudes and intentions to perform: past experience or mastery with the task, vicarious experience performing the task, emotional or physiological arousal regarding the task, and social persuasion to perform the task. Jere Brophy and Thomas Good (1970, 1974) provided a comprehensive model of how teacher expectations could influence children's achievement. Their model posits that teachers' expectations indirectly affect children's achievement: "teacher expectations could also affect student outcomes indirectly by leading to differential teacher treatment of students that would condition student attitudes, expectations, and behavior" (Brophy, 1983, p. 639). The model includes the following sequence. Teachers form differential expectations for students early in the school year. Based on these expectations, they behave differently toward different students, and as a result of these behaviors the students begin to understand what the teacher expects from them. If students accept the teachers' expectations and behavior toward them then they will be more likely to act in ways that confirm the teacher's initial expectations. This process will ultimately affect student achievement so that teachers' initial expectancies are confirmed. In discussing work related to this model, Brophy (1983) made several important observations about teacher expectation effects. First and foremost, he argued that most of the beliefs teachers hold about student are accurate, and so their expectations usually reflect students' actual performance levels. As a result, Brophy contended that selffulfilling prophecy effects have relatively weak effects on student achievement, changing achievement 5% to 10%, although he did note that such effects usually are negative expectation effects rather than positive effects. Second, he pointed out that various situational and individual difference factors influence the extent to which teacher expectations will act as self-fulfilling prophecies. For instance, Brophy stated that expectancy effects may be larger in the early elementary grades, because teachers have more one-on-one interactions with students then, as they attempt to socialize children into the student role. In the upper elementary grades more whole-class teaching methods are used, which may minimize expectation effects. Some evidence supports this claim; expectancy effects in Rosenthal and Jacobson's (1968) study were strongest during the earlier grades. Raudenbush's (1984) meta-analysis of findings from different teacher expectancy studies in which expectancies were induced by giving teachers artificial information about children's intelligence showed that expectancy effects were stronger in Grades 1 and 2 than in Grades 3 through Grade 6, especially when the information was given to teachers during the first few weeks of school. These findings are particularly relevant because they show a form of the expectancy theory and how teachers have certain expectations of students and how they treat the students differently because of those expectations. Some of the critics of the expectancy model were Graen (1969) Lawler (1971), Lawler and Porter (1967), and Porter and Lawler (1968). Their criticisms of the theory were based upon the expectancy model being too simplistic in nature; these critics started making adjustments to Vroom’s model. Edward Lawler claims that the simplicity of expectancy theory is deceptive because it assumes that if an employer makes a reward, such as a financial bonus or promotion, enticing enough, employees will increase their productivity to obtain the reward. However, this only works if the employees believe the reward is beneficial to their immediate needs. For example, a $2 increase in salary may not be desirable to an employee if the increase pushes her into a tax bracket in which she believes her net pay is actually reduced, which is actually impossible in the United States with marginal tax brackets. Similarly, a promotion that provides higher status but requires longer hours may be a deterrent to an employee who values evening and weekend time with their children. In addition to that, if anyone in the armed forces or security agencies is promoted, there is a must condition for such promotions, that they he/she will be transferred to other locations. In such cases, if the new place is far from their permanent residence, where their family is residing, they will not be motivated by such promotions, and the results will be other way round. Because, the outcome, which this reward (promotion) will yield, may not be valued by those who are receiving it. Lawler’s new proposal for expectancy theory is not against Vroom’s theory. Lawler argues that since there have been a variety of developments of expectancy theory since its creation in 1964; the expectancy model needs to be updated. Lawler’s new model is based on four claims. First, whenever there are a number of outcomes, individuals will usually have a preference among those outcomes. Two, there is a belief on the part of that individual that their action(s) will achieve the outcome they desire. Three, any desired outcome was generated by the individual’s behavior. Finally, the actions generated by the individual were generated by the preferred outcome and expectation of the individual. Instead of just looking at expectancy and instrumentality, W.F. Maloney and J.M. McFillen  found that expectancy theory could explain the motivation of those individuals who were employed by the construction industry. For instance, they used worker expectancy and worker instrumentality. Worker expectancy is when supervisors create an equal match between the worker and their job. Worker instrumentality is when an employee knows that any increase in their performance leads to achieving their goal. In a chapter entitled "On the Origins of Expectancy Theory" published in Great Minds in Management by Ken G. Smith and Michael A. Hitt, Vroom himself agreed with some of these criticisms and stated that he felt that the theory should be expanded to include research conducted since the original publication of his book. Motivation Theory is a theory that attempts to explain how and why individuals are able to achieve their goals. Expectancy Violations Theory (EVT) is a theory that predicts communication outcomes of non-verbal communication. Expectancy Theory of Motivation (Porter & Lawler, 1968; Vroom, 1964) is one of the process theories. This theory is a model of behavioral choice, that is, as an explanation of why individuals choose one behavioral option over others. In doing so, it explains the behavioral direction process. It does not attempt to explain what motivates individuals, but rather how they make decisions to achieve the end they value. Expectancy theory is about work motivation that focuses on how workers make choices among alternative behaviors and level of efforts. Expectancy theory focuses on how workers decide which specific behaviors to perform and how much effort to exert. According to expectancy theory, workers commitment and productivity in organization is based on his answers to basic questions: is desirability of outcomes that organization provides high? Is high performance instrumental for obtaining these outcomes? Is expectancy high? Based on it, there are three key concepts or components in Expectancy theory: valence, instrumentality and expectancy. The term valence refers to the desirability of an outcome to an individual worker. Workers can obtain a variety of outcomes from their jobs such as pay, job security, benefits, feelings of accomplishment, promotions. Valence can be positive or negative and can vary in size and magnitude. The magnitude of valence is how desirable an outcome is for a worker. Motivation problems occur because highly valent outcomes may be unavailable to workers. The provision of highly valent outcomes to workers is important to motivate and retain valuable employees. 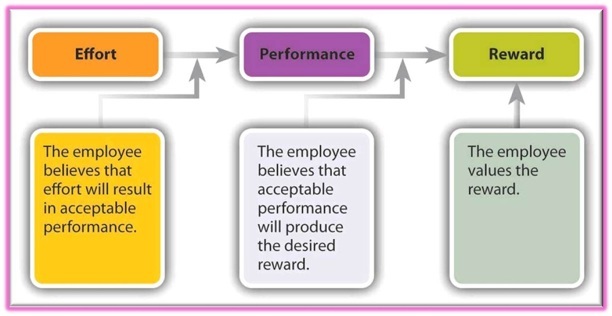 Valence is first component of expectancy theory and is important factor to decide motivation factor for employee and its performance. Valence must be high, workers must desire or want the outcomes they received if they perform at a high level. Therefore managers must determine what outcomes a worker desires, or the valence of different outcomes for the worker. Second key factor in expectancy theory is Instrumentality. It is perception about the extent to which performance of one or more behaviors will lead to the attainment of a particular outcome. It is association between a certain level of job performance and the receipt of a specific outcome. As per theory, an instrumentality of –1 means that a worker perceived that performance definitely would not result in obtaining the outcome. An instrumentality of +1 means that a worker perceives the performance definitely will result in obtaining the outcome. An instrumentality of zero means that a worker perceived no relationship between performance and outcome. Instrumentalities that are in fact high and that workers believe are high are effective motivators. Sometimes workers are not motivated to perform at high level because they do not perceive that high performance will lead to highly valent outcomes. When workers think that good performance goes unrecognized, their motivation to perform at high level tends to be low. Therefore managers need to make sure that workers who perform at a high level receive outcomes that they desire that is outcomes with high positive valence. Instrumentality must be high in order to be motivated to perform desired behaviors at a high level. 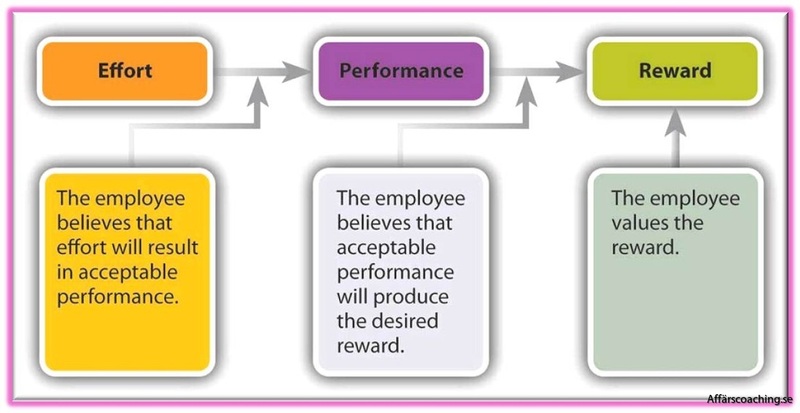 Third key factor in expectancy theory is Expectancy, a worker’s perception about the extent to which his or her efforts will result in a certain level of job performance. Workers are going to be motivated to perform desired behaviors at a high level only if they think they can do so. As per theory, an expectancy of 1 signifies that a worker is sure that his or her effort will lead to a certain level of performance. An expectancy of 0 means that a worker believes there is no chance that his or her effort will result in certain level of performance. Expectancy is high when they think they actually will perform at a high label when they work hard. Managers have to boost morale if they think works expectancy is 0. Helping them improving their skills and abilities can boost expectancy of workers. Expectancy must be high and workers must perceive that if they try hard, they can perform at a high level. In order for workers to be motivated to perform desired behaviours at a high level, valence must be high, instrumentality must be high and expectancy must be high.